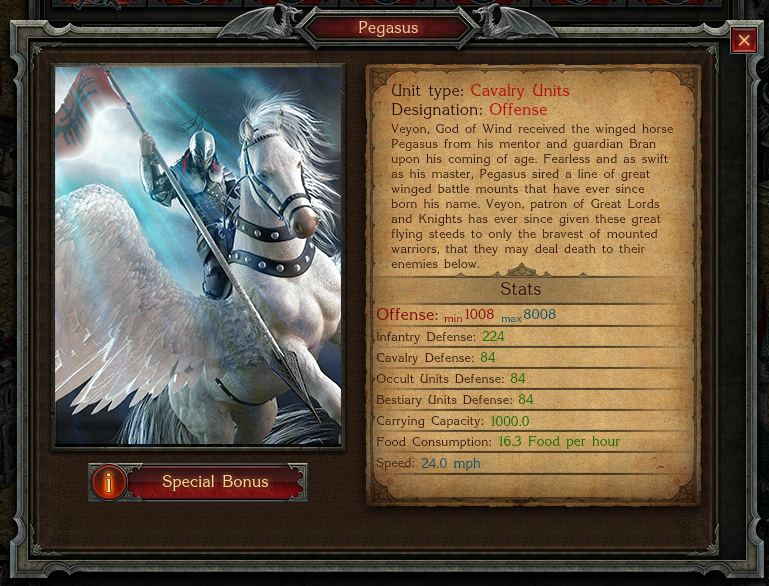 Pegasus is a Legendary Unit. As the screenshot below shows, 1 Pegasus in your ranks can add up to +7000 bonus points spread over 25 different Offensive Cavalry Units. In the screenshot below, a Dark Reaver receives a +280 point bonus to its Offensive statistics, whereas a Great Lord receives +250. Send 20 Dark Reavers out alongside 1 Pegasus, and suddenly your forces are +5600 Offensive points stronger than they would be without the support of a Legendary Unit. Since each Dark Reaver has 378 Offense, sending 20 of them out alongside Pegasus is almost equal to sending out an extra 15 Dark Reavers. 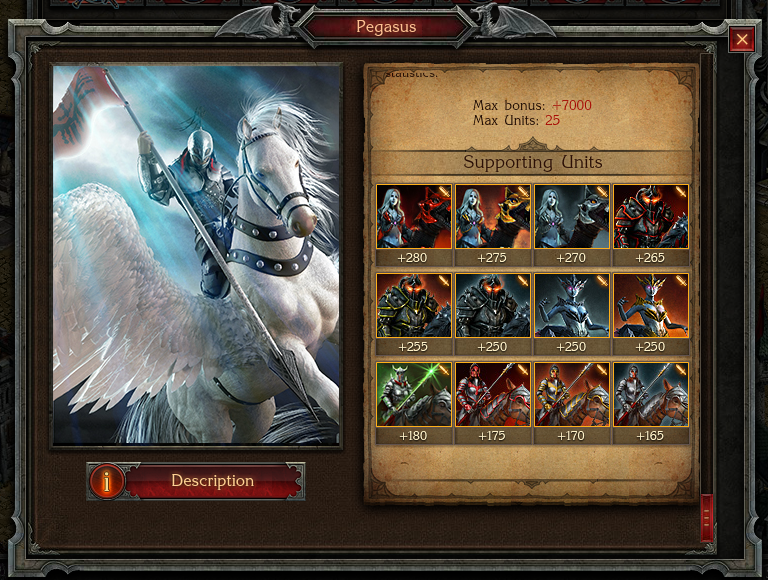 Include Pegasus’ Offense in that count, and you’re almost doubling the strength of your Dark Reavers by sending them out with a single unit. I don’t need to tell you how good that is. All the time! Just take a quick stroll over to the Black Market and get one for yourself. Send these units out with your Offensive Cavalry, such as Knights, Priestess’, Great Lords and Reavers and they’re suddenly a force to be reckoned with! As explained above, sending a Pegasus out with a full accompaniment (25) Dark Reavers, and including Pegasus’ own Offensive stats, you’re more than doubling your army’s strength. Suddenly, that force of 25 Dark Reavers is now effectively a force of 50, turning possible cannon fodder into a formidable force. Compare the costs of both. One Reaver is 55 Sapphires to buy, whereas one Pegasus is 518. For the price of one Pegasus, you can only get your hands on 9.4 (so, 9 and a few spare horse legs) of Reavers. Buy one Pegasus for 518 and send it out with a full 25 Reavers, and you’re getting the bonus Offensive points of almost 19 extra Reavers, effectively doubling the strength of your army and saving money in the process. Visit the Black Market, spend some money and get one! If you were considering spending some money on Units anyway, then think of this as an investment. It saves you money in the short run by immediately giving you a more cost-effective Offense, and saves you money in the long run as the stronger your army, the less your Units will die and the less you’ll spend on reviving them. Whichever way as you look at it, it’s an awesome deal for any player wanting to improve his army in the most efficient way possible!